It’s not difficult to picture that fictitious, flannel-clad gardener, advanced in years, tending the grounds around his abode, letting his plot live a woollier life than the manicured expanses at the estate. Coming in from the damp air, he warms himself by the fire, and then sets a kettle on for tea in the cozy kitchen. A visitor spying the winter coats, scarves, and hats, hung just inside the front door, might think it’s entirely plausible one of those jackets belongs to the gardener, not Fitzgerald or his partner, Jack Hammack, who make the trek from Dallas to this calm retreat each month. 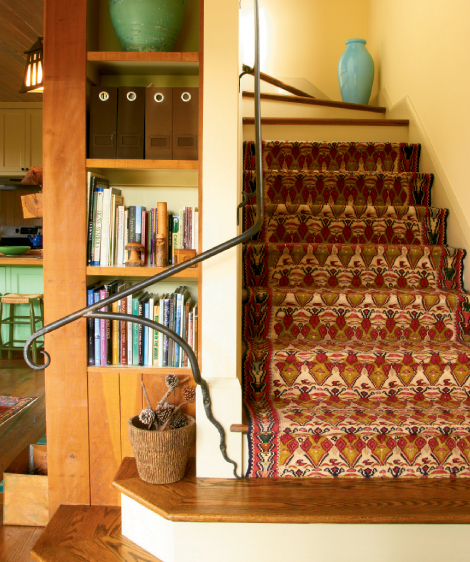 Fitzgerald, a residential developer, dreams up tales to guide the design and style of each home he and Hammack, a contractor and artist, remodel. They’ve revitalized more than 20 over the years in their full-time city, including a grand Spanish Revival built in 1937, which was recently named one of Dallas’s 10 Most Beautiful Homes of 2011 by D magazine. The true story of how the two found themselves in Western North Carolina and the home came to be holds its own charm. During a vacation in Hilton Head, they set off to spy the Grove Park Inn, a building Chas had admired in photographs. They took the back roads and arrived after dark. In the morning, Jack watched the fog clear to reveal the lush hills. “He said, ‘This is it. I have to live here,’ ” recalls Fitzgerald. They never made it to Chimney Rock that day, but framed vintage postcards of the attraction—just a few among Fitzgerald’s extensive collection depicting local landmarks—hang in the stairwell to honor the drive that brought them home, so to speak. After two years of planning, which filled a scrapbook with Fitzgerald’s design ideas, the 1,300-square-foot house was complete. The exterior speaks a local design vernacular with pebbledash and wood elements reminiscent of the Tudor-style cottages in Biltmore Village and rough-and-tumble stone columns modeled after the Grove Park Inn. “I wanted the house to be as indicative of the region as possible,” says Fitzgerald. The sentiment applies indoors as well. Fitzgerald has cultivated an authentic North Carolina aesthetic with genuine articles, from blankets made at Beacon Manufacturing, which once stood in Swannanoa, to the latest acquisition, a green lotus vase by the Voorhees family of potters. Each item serves a purpose beyond its inherent beauty; they ground the owners in the heritage that attracted them to the mountains. “I love how the old traditions are cared for here,” says Fitzgerald. The local touches also evoke a sense of community. The Amish-made oak and hickory dining table and branch chairs were procured at Bramblewood in Black Mountain. The chandelier that hangs above was crafted by Dan Howachyn of Black Mountain Ironworks. Even the art, including many paintings by Georgia folk artist John “Cornbread” Anderson and landscapes by Richard Oversmith, was discovered at local galleries. “As my mom says, ‘every piece has a story,’ ” says Fitzgerald. Throughout the home, the local discoveries and arts-and-crafts elements are harmoniously juxtaposed with exotic touches, such as Persian rugs and a thoughtful infusion of Indian, Mexican, and Mediterranean furniture and art. The recognition that these styles can highlight each other is especially evident in the guest suite, where a custom log bed is dressed with a spread from India and an intricate tapestry from the same country adorns the wall. Back outside, Fitzgerald, also a landscape architect, strolls the garden and points out the Joe pye weeds he’s taken a shine to, as well as native ferns. There’s a sense of wonder and joy in the way he describes the flora and fauna. When he speaks, the line between the story he bestowed upon Ravencroft and reality becomes lost in the foliage. Perhaps he is that gardener, tricking time, and this was meant to be his and Jack’s home always, adding another intriguing chapter to the story.